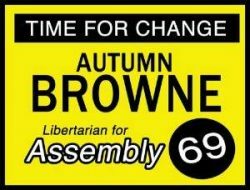 Autumn Browne, a lifelong Libertarian and a public school teacher with over 25 years experience, was a write-in candidate in the June Primary Election and now she is on the November 6, 2018 General Election ballot. Browne is the daughter of the renowned past Libertarian presidential candidate Harry Browne. He was an American writer, politician, and investment advisor. He was the Libertarian Party’s Presidential nominee in the U.S. elections of 1996 and 2000. He was also the author of 12 books that in total have sold more than 2 million copies, according to Wikipedia. His book How I Found Freedom in an Unfree World gave a detailed explanation of how one can bring libertarian concepts to every aspect of one’s life. You decide how your income and tax dollars are spent! Of course Autumn opposes all new taxes – a good thing as she is running in a district that includes much of the City of Santa Ana. The Santa Ana City Council and the SAUSD are both trying to pass tax increases this November. Why vote for Autumn? She sums it up well on her campaign website: Republicans and Democrats are making government larger every year. Libertarians are working to reduce government as far as possible.